Thousands of working men and women die every year while on the job, and many more are injured or fall ill from diseases caught at work. This week past week has been Worker’s Memorial Week of Action and we want to spotlight the positive effects that paid sick days would have on saving workers from illness and injury. The Occupational Safety and Health Act was passed on April 28th, 1970. Many have used that day to commemorate fallen workers and have named it Worker’s Memorial Day. We can applaud ourselves as a nation for how far we have come to ensuring workers are protected on the job. However, there is still much room for improvement, and one way to enhance worker’s health and safety is to pass paid sick days. Research shows that there is a direct correlation between the availability of paid sick days and the occurrence of workplace injuries. A study conducted by Abay Aswfaw shows that workers that have paid sick days are 28 percent less likely to be injured on the job compared to those who do not receive sick days. Workers that go to their jobs ill are most likely to be fatigued, sleep deprived and not thinking clearly –which leads to accidents and injuries. By providing paid sick days businesses will boost employee morale and reduce turnover, which will lead to savings for businesses in the long run. A healthy worker is a productive worker, and studies show that when employees are sick on the job (known as “presenteeism”) they are more likely to spread disease, and not be as profitable. Inevitably, employers pay more out of pocket for presenteeism than they would for absenteeism. Paid sick days lead to a healthy and happy workforce which ensures employee retention and good morale. 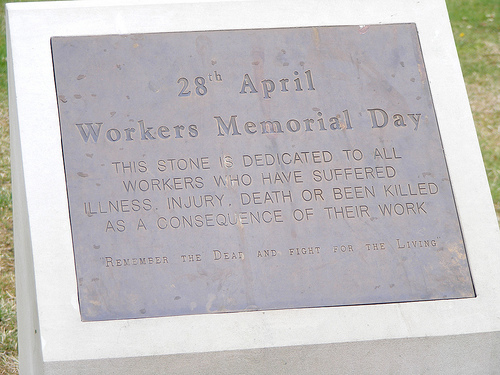 For Worker’s Memorial Week of Action, it is important to remember all of the worker’s lives that have been lost while we remain fighting for workplace rights of the future. Promote paid sick days by sharing these talking points about worker safety on your blogs, newsletters and other advocacy pieces. Together we can raise the bar for standard labor practices and give workers what they deserve.